F Tomáš Vincour (Edmonton, Vancouver, 2007-10) has signed a one-year extension with Brno (Czech Republic, Extraliga). This season, in 39 games, he had nine goals and 13 assists. The NHL’s Anaheim Ducks announced Friday that Rich Preston would be back for a second season as an assistant coach, alongside head coach Randy Carlyle and fellow assistant Trent Yawney. Preston and I were in Regina at the same time back in the day — I was at the Regina Leader-Post and he was coaching the Pats — so have known each other for a while. More recently, he spent four seasons (2009-13) as the general manager and head coach of the WHL’s Lethbridge Hurricanes. Anaheim’s announcement gives me reason to re-post one of my favourite stories from my stint with the late Kamloops Daily News. Here it is, from Oct. 1, 2009 . . .
Rich Preston has had friends in high places. Preston, the general manager and head coach of the WHL's Lethbridge Hurricanes, is friends with Condoleeza Rice, who was the first African-American woman to hold the office of United States Secretary of State. friends while both were attending the University of Denver in the early 1970s. Preston was there on a hockey scholarship; Rice was earning a BA in political science, which she got in 1974 at the age of 19. Preston said her family — her father, John, was an assistant dean and also taught — followed the hockey team closely and would have the team over to their home for dinner once every season. At one point, Preston said Rice asked him out. "It was one of those dances where the girls ask the guys," said Preston, before his squad met the Kamloops Blazers on Wednesday night at Interior Savings Centre. "Still, it was in 1972-73 . . . but I was Canadian." In other words, eyebrows were raised when the two of them showed up at the dance. Later, the two would go their separate ways. 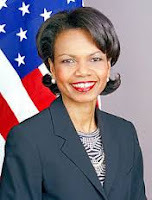 After a stop at Stanford University, Rice ended up in the White House as President George W. Bush's National Security Advisor. Preston wound up as an assistant coach with the NHL's San Jose Sharks. To make a long story shorter, Preston eventually got through to Rice's personal assistant and asked to leave a message for Rice. "I said, 'Just tell her Sergeant Preston called. She'll know who it is,' " a chuckling Preston recalled. His nickname while playing hockey at Denver was Sergeant Preston, after the legendary Mountie, of course. Preston told the assistant when the Sharks were to be in Washington and at what hotel they would be staying. When the team arrived and he got to his room, there was a message from Rice awaiting him. "So I called her back," he said, "and we talked for about 20 minutes." As the conversation wound down, Rice told Preston that she would love to meet him for coffee but that she "had a meeting with the President" at 5:30, which was minutes away, immediately after which she was flying to Europe for a NATO meeting. 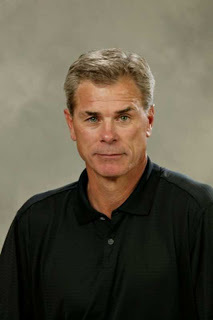 As expected, the Spokane Chiefs announced on Monday that they have signed Dan Lambert as their new head coach. He is the 12th head coach in franchise history. . . . Lambert, 47, will be introduced to the Spokane fans and media at a news conference this afternoon (Tuesday) at Spokane Arena. . . . Lambert, who captained the Swift Current Broncos when they won the 1989 Memorial Cup, was fired by the NHL’s Buffalo Sabres as head coach of their AHL affiliate, the Rochester Americans, on May 26. That was part of a regime change in Buffalo, where Lambert had spent 2015-16 as an assistant coach with the Sabres before being assigned to Rochester. . . . Prior to that, Lambert spent six seasons with the Kelowna Rockets, the first five as an assistant coach. In 2014-15, his one season as Kelowna’s head coach, he guided the Rockets to a WHL title (53-13-6) and into the Memorial Cup, where they lost the final, 2-1 in OT, to the OHL-champion Oshawa Generals. . . . The length of Lambert’s contract wasn’t disclosed. . . . Lambert replaces Don Nachbaur, the Chiefs’ head coach for the previous seven seasons. He and the team went their own ways after their season ended, even though Nachbaur had a year remaining on his contract. There now are three WHL teams without head coaches — the Calgary Hitmen, Kootenay Ice and Victoria Royals. F Boston Maxwell has signed a WHL contract with the Prince George Cougars. From Saskatoon, Maxwell was a fourth-round selection in the WHL’s 2017 bantam draft. This season, with the bantam AA Saskatoon Stallions, he had 22 goals and 21 assists in 30 games. He will play with the midget AAA Saskatoon Contacts in 2017-18. The Moose Jaw Warriors have signed F Peyton McKenzie to a WHL contract. A native of Sherwood Park, Alta., he was a third-round selection in the 2017 WHL bantam draft. This season, he had 16 goals and 20 assists in 27 regular-season games with the bantam AAA Sherwood Park Flyers. He added six goals and six assists in 10 playoff games. Former WHL scoring champion F Casey Pierro-Zabotel had a goal and an assist and was named the game’s first star as the Colorado Eagles beat the South Carolina Stingrays 2-1 on Monday in North Charleston, S.C., to sweep the ECHL’s best-of-seven championship final. . . . The Eagles won four one-goal games. . . . Pierro-Zabotel, who won the WHL’s 2008-09 scoring title while with the Vancouver Giants, opened the scoring at 17:10 of the first period with his fourth goal of the playoffs. He added an assist, his 11th, on F Luke Salazar’s tie-breaking goal at 1:19 of the second period. . . . Pierro-Zabotel has won back-to-back Kelly Cups, as he was with the Allen Americans a year ago. . . . Colorado’s lineup last night also included former WHLers D Mason Geertsen (Edmonton, Vancouver, 2011-15), D Sean Zimmerman (Spokane, 2003-07), F Johnny Lazo (Tri-City, 2007-10), D Teigan Zahn (Saskatoon, 2006-11), F Cam Maclise (Edmonton, 2009-10), F Ryan Harrison (Prince Albert, Medicine Hat, Everett, 2008-13) and G Kent Simpson (Everett, 2008-12), who backed up last night. . . . Zimmerman is the team captain. . . . F Jackson Houck (Vancouver, Calgary, 2011-16) also is on Colorado’s roster, although he hadn’t played since May 13. . . . The Eagles won their last eight games. They also set an ECHL playoff record with six OT victories. . . . Announced attendance: 5,519. . . . Former Prince Albert Raiders head coach Chris Stewart (1995-98) is Colorado’s president and general manager, while Ryan Tobler, who played with Saskatoon, Calgary, Swift Current and Moose Jaw (1994-97), is an assistant coach. The Kootenay Ice’s new owners have set a target of 2,500 season-ticket holders. The Ice went into this season having sold 1,315.